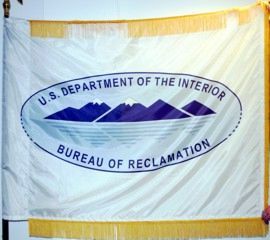 The Bureau of Reclamation (USBR) in the Department of Interior has a flag. It is a full color version of the USBR seal on a white flag. On the USBR site (www.usbr.gov) I could only locate the logo in one color, but I located a color version here and it looks very much like the flag seal.